Cheese filled soft pretzel sticks. Ready in seconds! Scan for more info! Superpretzel Softstix Cheddar combines the fresh baked Superpretzel Soft Pretzel taste with a burst of scrumptious cheddar cheese flavor. 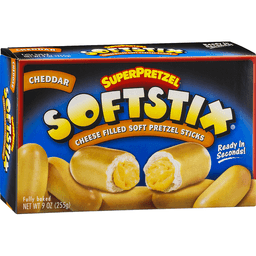 Serve Softstix as appetizers, party treats or an anytime snack! Carton made from 100% recycled paperboard; minimum 35% post-consumer content. Facebook. 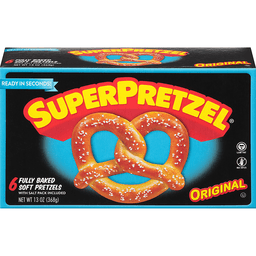 Try other delicious snacks from SuperPretzel! For fun facts, product info & recipes, log onto www.superpretzel.com. Consumer information call 1-800-486-9533.